Statement of Problem: Tetrahydrozoline has been introduced as new gingival retraction agent but its clinical efficacy with widely used conventional retraction agents has not been tested. Purpose: The study was designed to clinically evaluate efficacy of newer retraction agent tetrahydrozoline with two widely used retraction systems i.e., Expasyl retraction system and medicated retraction cords on basis of amount of gingival retraction. Materials and Methods: 30 subjects were selected according to inclusion and exclusion criteria. Maxillary Impressions were made with irreversible hydrocolloid for all subjects. Tray material was used for making the special tray. Latin Block Design was Used in the Study to avoid tissue fatigue. Retraction was done with aluminium chloride; Tetrahydrozoline and Expasyl according to Latin block design. Impressions were poured with die stone. Casts were retrieved and sections were made with die cutter. 3 mm thin slices were obtained. Each slice was used to measure the amount of retraction under stereomicroscope under 20x and images were transferred to image analyser. 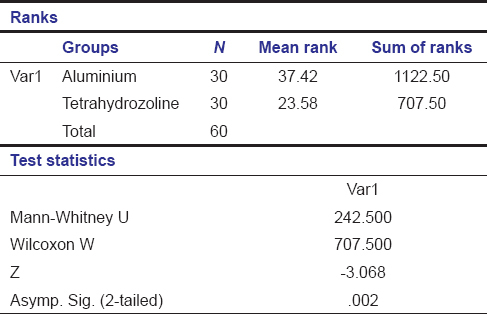 Results: The amount of gingival retraction obtained by using aluminium chloride as gingival retraction agent was maximum (148238.33 μm 2 ) compared to tetrahydrozoline (140737.87 μm 2 ) and Expasyl (67784.90 μm 2 ). Success of fixed prosthodontics restorations is largely dependent upon the long-term health and stability of the surrounding periodontal structures. No single restoration in dentistry is more dependent upon, nor influences more the health of periodontal structures than the full coverage restoration. Full coverage preparations often require subgingival margins because of caries, existing restorations, esthetic demands, or the need for additional retention. , In such situations, the clinician must make impressions that accurately capture the prepared cervical finish lines and permit the fabrication of accurate dies on which the restorations are fabricated. However, often the cervical finish lines captured by the clinicians are inadequate. The inability of the impression materials to adequately displace soft tissues, fluids or debris mandates adequate isolation. The gingival displacement procedure allows the impression material to flow apical to the subgingival finish line thereby registering it and an area apical to it. These procedures lead to easy instrumentation, clear visualization, and good impression, resulting in a quality prosthesis having a marginal fidelity and a sound emergence profile. Exposing the gingival margins of a preparation prior to making impression may be one of the most difficult procedures for the dentist to perform. This difficulty is further complicated by variations in the sulcular depth, distendability of gingival tissues, degree of gingival inflammation, level of margin placement and tissue laceration. Several clinical methods are available for adequate gingival displacement, including mechanical displacement, chemico-mechanical displacement, electrosurgery, and rotary gingival curretage. , The chemico-mechanical method of using a retraction cord impregnated or soaked in various chemicals is the most frequently used method. , The retraction cord mechanically displaces the gingival tissue and absorbs moisture contamination in the gingival sulcus, while the chemical agents control hemorrhage and shrink the gingival tissues. The pH of gingival displacement agents is commonly in an acidic range. Prolonged exposure to these agents causes alteration and instability in smear layer and produces etching up to several degrees, which usually happens as the recommended time for a chemico-mechanical displacement is 7-10 min. , An answer for this would be to use the agents at a neutral or alkaline pH solution, but these agents are highly unstable and do not exert their astringent effect at an alkaline pH. Nasal decongestants like tetrahydrozoline and oxymetazoline have been introduced as gingival displacement solutions. However, studies to test clinical efficiency of these agents have not yet been reported. Hence this clinical study was planned in Department of Prosthodontics of K. M. Shah Dental College, Sumandeep Vidyapeeth, Vadodara, India to evaluate the level of gingival displacement produced by three different gingival displacement systems such as aluminum chloride retraction cords, expasyl, and tetrahydrozoline soaked retraction cord. The study was approved by the Ethics Committee of Sumandeep Vidyapeeth. Thirty participants are having healthy periodontium and gingival index of score 0 within age group of 20-25 years were included in the study. Participants with anterior malocclusion, gingival recession, pregnant and lactating women were excluded from the study. Participants undergoing orthodontic treatment and allergic to tetrahydrozoline and aluminum chloride were also not included for the study. The Loe H and Silness J  gingival index was followed. Consent for participation in the study was sought through proper consent form. Maxillary Impressions were made with irreversible hydrocolloid impression material for all 30 participants custom trays were fabricated so that they would be kept 2 mm short of sulcus. Impressions were made using a custom tray after 24 h of fabrication. The schedule for gingival displacement and impression making followed a Latin block design which is presented in tabular form in [Table 1]. On day 1 - the baseline impression was made. On day 2, day 17, and on day 32 impressions was taken after displacement with anyone of 3displacement agents according to Latin block design. Baseline impressions were made for the control group in which no gingival displacement was done. The impressions were made after removing the spacer from the custom tray. Perforations were made in the custom tray with round bur. Impressions were made with addition silicon, Type 2 medium body (Monophase). Impressions were made and removed from participant's mouth after the material was set. Once the impressions were made, they were disinfected with glutaraldehyde solution. Isolation was done on right central incisor with cotton rolls to maintain dry working area. The required dimension of the retraction cord was selected according to the gingival biotype of the subject. Retraction cord impregnate with aluminum chloride looped around the labial surface of the tooth and gently pushed into the sulcus with the gingival cord packer instrument [Figure 1]a]. Retraction cord was removed after keeping for 10 min in the gingival sulcus. Impressions were made in similar way as the baseline impressions. Participants were recalled for evaluation of gingival health after 15 days. The gingival index was reconfirmed to be zero in right central incisor. Same impression procedure was repeated with tetrahydrozoline solution and retraction cord of same size and type [Figure 1]b] (Visine, Johnson and Johnson Health Care Products, USA). Impressions were made in similar way as the baseline impressions. Participants were recalled for evaluation of gingiva. The index was reconfirmed to be zero in right central incisor. The expasyl displacement paste was injected slowly into the sulcus resting on the tooth [Figure 1]c]. At the end of 2 min expasyl paste was washed away from sulcus using air and water spray. Impressions were made in similar way as the baseline impressions. Each of the four impressions was poured immediately with die stone. Mesio-distal width of right central incisor was measured with help of vernier caliper and the center point of the tooth was marked on the cast, a second marking was made 3 mm distal to the first marking for the secondary cut. Cast was positioned and stabilized on platform of die cutter, and primary cut was made on the marked central portion of incisal edge in the buccolingual direction through the entire length of the cast. A second cut was made distal to the primary cut along the entire length of the cast such that a 3 mm thick buccolingual slice was obtained. For determining the amount of displacement, sample was studied under a microscope having magnification of ×20. Image was captured and transferred to the MIC 3.0 image analyzer. Perpendicular line was drawn from the most prominent point of the crest of marginal gingival to the tooth surface. This area was automatically selected, and the area value was obtained from the software as the measured amount of displacement. 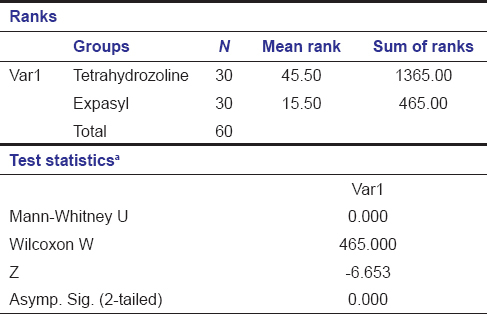 The values of gingival displacement for all the specimens in μm 2 tabulated [Table 2] and subjected to statistical analysis. The area of amount of lateral space between marginal gingiva and the tooth structure was observed under a stereomicroscope at ×20. The images were imported into the image analyzer and the area was calculated. The prepared specimens of the control group were measured for the amount of gingival displacement as shown in [Figure 2]. Gingival displacement with aluminum chloride was measured with a similar method as shown in [Figure 3]. Tetrahydrozoline as gingival displacement agent was evaluated with stereomicroscope and image analyzer as shown in [Figure 4] and expasyl group was also analyzed similarly as shown in [Figure 5]. 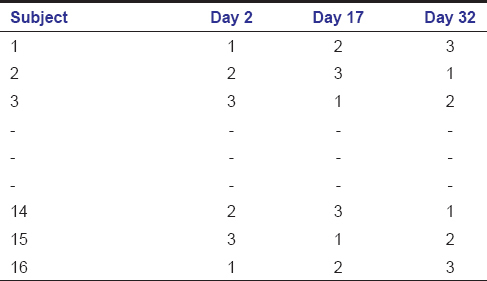 Statistical analysis were done between control group and test groups and among test groups using Mann-Whitney Test [Table 3] [Table 4] [Table 5] and Kruskal-Wallis test was done for statistical analysis among all test groups [Table 6]. The results suggest that all 3displacement agents produced statistically significant amount of displacement. 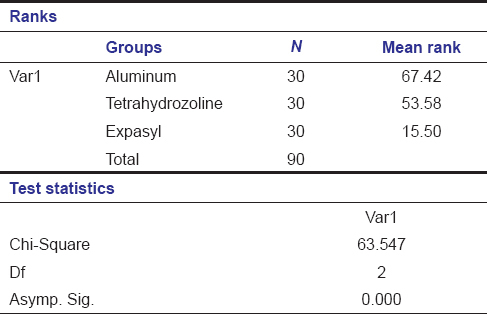 The mean (±standard deviation [SD]) of gingival displacement achieved by four groups namely control, aluminum chloride, tetrahydrozoline and expasyl are 26883.53 ± 2657.674 μm 2 , 148238.33 ± 8793.289 μm 2 , 140737.87 ± 9097.293 μm 2 , 67784.90 ± 14289.945 μm 2 , respectively. According to acquired data displacement cord with aluminum chloride produces the highest amount of displacement when compared with two other test groups. The least amount of displacement was found with expasy that is, 67784.90 μm 2 . The marginal integrity is one of the most basic criteria of the principles of tooth preparation. The placement of margin or finish line in relation to the gingival margin has direct bearing on fabrication of restoration and health of the periodontal tissue of the prepared abutment teeth. From the periodontal point views, it is preferable to place the gingival finish lines of restoration supragingivally or equigingivally. For esthetics or other reason such as caries existing restoration and need for additional retention, the dentist may be forced to place them subgingivally. This requires some form of gingival displacement, for making the impression. ,, The mechanical effect of the cord itself will be considered equal for all materials. However, the action of the medicament is different according to their mechanism of action. Chemical impregnated cords are the most commonly used technique of gingival tissue displacement. , Use of the cord impregnated with aluminum chloride (5-10%) is referred to be the safest and most effective method of gingival displacement. , Aluminum chloride solution (10%) acts as hemostatic agent and astringent. It has ability to precipitate protein, constrict blood vessels and extract fluid from tissues. It is highly soluble in water, freely soluble in alcohol and soluble in glycerine. Aluminum chloride has no contraindications and minimal side effects when used in lower concentration. The results of this study prompted us to include aluminum chloride as the first experimental group in the study. Sympathomimetic amines like oxymetazoline and tetrahydrozoline can also be used as a gingival displacement agent. However, it has been reported in the previous studies that pH of tetrahydrozoline is alkaline so causes less damage to the gingival tissues and also to the tooth structure. It is safe to use tetrahydrozoline as gingival displacement solution, which was the agent used in the study. Expasyl displacement technique provides excellent hemorrhage control as compared to medicated displacement cord technique. This may be attributed to the increased concentration of aluminum chloride in expasyl displacement system (15%) as compared to medicated displacement cord (10%). 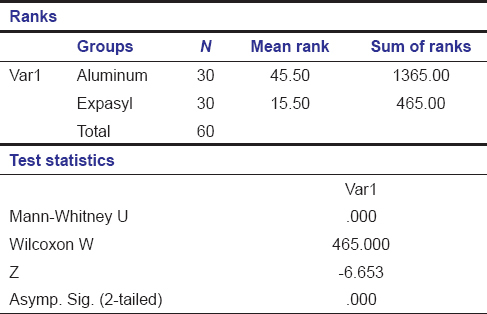 Hence expasyl was included as the third experimental group to evaluate if the increase in concentration and the medium of dispensing aluminum chloride in the gingival sulcus as a paste have a role in the amount of displacement. The patients with anterior malocclusion, gingival recession, patient under orthodontic treatment, known allergic to tetrahydrozoline and aluminum chloride and systemic condition such as pregnancy and lactating women were excluded for the study. The participants with anterior malocclusion may raise difficulty in measurement, making impression and placement of gingival cord due to rotated teeth or crowding of teeth and thus were excluded from the study. Participants with systemic condition such as pregnancy and lactating women were excluded to avoid giving unwanted stress to the participants. Latin block design was used in sequence of gingival displacement to avoid the tissue fatigue in this study. It may be logical to think that the amount of displacement produced during the first displacement be the least where compared to the last displacement or vice versa. This would mean that the first agent and the last agent may give results not true to their chemistry but by virtue of the amount of tissue fatigue that occurs during the procedure of displacement. Though 15 days has been advocated as the minimum time needed for the gingival tissues to recover if traumatized, a Latin block design that gives equal chance for each agent to be placed at different rank order of treatment was used in this study. The sequence of displacement with aluminum chloride, tetrahydrozoline and expasyl was not similar for each subject and was ordered according to the Latin block design, thus eliminating the bias. Gingival displacement cord selected was of a nonimpregnated variety. Preimpregnated aluminum chloride cords are available, but cords impregnated with the tetrahydrozoline are not commercially available. Therefore to use a preimpregnated aluminum chloride cord and impregnate a plain cord with the tetrahydrozoline at the time of use was found unfit for the study design. Hence, plain nonimpregnated cords were used for both the solutions. Further the results of a study by Runyan et al. indicated that soaking displacement cords in aluminum chloride solution does not lessen the cords ability to absorb fluid. Because aluminum chloride solution does aid in hemorrhage control, soaking cords before placement may be a useful adjunctive technique. They advocated a 20 min soak period for successful displacement. Hence, this soaking time was used for both the solution. In 1978, Van der Velden and De Vries  studied the forces applied to the sulcus during various dental procedures. The principal investigator was the same person who was calibrated and was trained in the use of the cord packer with the recommended force. He performed the displacement in all the participants. They reported that with expasyl displacement technique it is possible to achieve adequate opening of the sulcus without damaging the epithelial attachment. Laufer et al. investigated the length of the time medicated displacement cords should remain in the gingival crevice prior to impression making. They concluded to achieve a crevicular width of 0.2 mm, cord should remain in the gingival crevice for an optimum time of 4 min prior to impression making when using materials evaluated in this study. However, contemporary textbooks recommended that the cord should remain in the gingival crevice for an optimum time of 10 min. Hence, the displacement cord was allowed to remain in the sulcus for 10 min. For impression making single step technique was used to avoid discrepancy that may creep in due to the use of two materials, tray positioning and the time that elapses in the two-stage procedure between removal of the cord and the impression making. Furthermore, in double mix single step technique it is difficult to control the burn out effect. Putty may displace the light body and show an error so single step impression technique, therefor medium body consistency monophase material was used. In the present study, a method of pouring the impression of retracted gingival and measuring this amount of displacement on the sectioned part of the cast under microscope with image analyzer system was followed. This method in part is similar to the technique used by Bowles et al.,  Casts were made and compared with the pretreatment casts. Sections of the casts were sawed out, and the teeth under investigation were sectioned buccolingually at the buccal eminence, followed by quantitative measurement of the width of the retracted sulcus, under a low-power microscope equipped with a 0.25-mm grid. The width was measured as the distance from the tooth to the crest of the gingiva. However, the 0.25-mm grid may not be a suitable grid measure for measuring gingival displacement as the minimum amount of displacement in human gingival has been reported to be 0.2 mm. Further digital measurement of the amount of displacement, as followed in this study, gives measurement with at least count of about 1 μ. Yet another technique of measuring the amount of displacement has been reported in the study done by Raja and Nair. The results suggest that all three displacement agents produced statistically highly significant amount of gingival displacement when compared with baseline. The mean (±SD) for the four groups namely control, aluminum chloride, tetrahydrozoline and expasyl are 26883.53 ± 2657.674, 148238.33 ± 8793.289, 140737.87 ± 9097.293, 67784.90 ± 14289.945), respectively. Comparison of the means of the experimental groups, with the control group, shows a highly significant amount of difference. 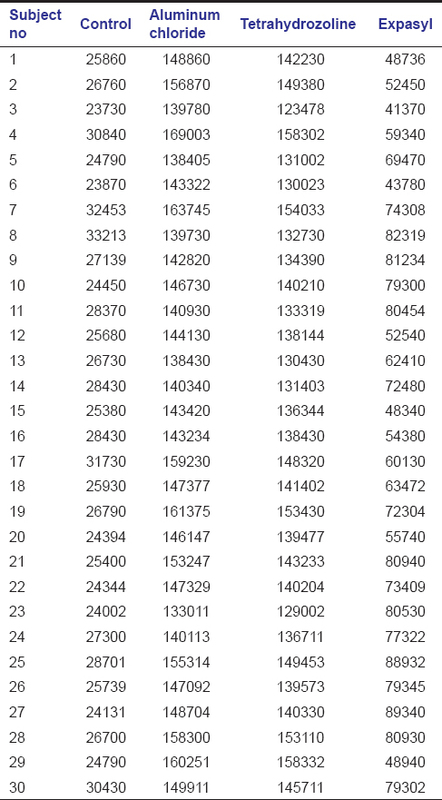 This means that all the three agents are capable of producing some amount of displacement, with the group II (displacement cord with aluminum chloride) showing the highest amount of displacement that is, 148238.33 μm 2 , next in line the group III, (displacement cord with tetrahydrozoline) showing 140737.87 μm 2 displacement, the least amount of displacement was found with group IV (expasy) that is, 67784.90 μm 2 . The study done by Raja and Nair  measured displacement in the vertical direction Whereas; we measured the horizontal displacement. Hence, a comparison of these studies is not appropriate. The result of displacement produced by tetrahydrozoline in this study is comparable to the results obtained by Bowles et al. Any medicament used for displacement should satisfy the following criteria; it must be effective, use of medicament in a cord must result in sufficient lateral displacement of the gingival tissue contaminated with tissue shrinkage and control of hemorrhage and fluid seepage to allow the dentist to make an adequate impression of gingival finish line of the prepared tooth. Use of material should not cause significant irreversible tissue damage (tooth and gingiva). Use of the material should not produce potentially harmful systemic effect. With respect to the criteria mentioned above, displacement cord with tetrahydrozoline shows excellent displacement, has negligible harm to tissue and has no potentially harmful systemic effects. Hence, the use of tetrahydrozoline in conjunction with displacement cord can be recommended as a safe and efficient displacement system. Being in vivo study most limitations of in vitro design are eliminated as the measurements are obtained from the mouth. The measurement made by direct means in the patient's gingival sulcus is considered full proof. But in present study measurements are the indirect measurement made from the casts which in turn are made from the impression of displaced gingiva. Therefore uncontrollable parameters like that of material flow and die material stability could have altered the result. However in the absence of such a direct measuring methodology the present study holds good. Further research into developing such a direct measure should be done for more accurate representation. The conclusions that were drawn from this study are: All three displacement systems namely (aluminum chloride, tetrahydrozoline, expasyl) show clinically and statistically significant amount of displacement. Among the three displacement agents tested, displacement cord with aluminum chloride showed the maximum displacement. Expasyl shows the least amount of displacement. Considering the result that displacement cord with the tetrahydrozoline produce comparable displacement as aluminum chloride and can be a good alternative to it. Ferencz JL. Maintaining and enhancing gingival architecture in fixed prosthodontics. J Prosthet Dent 1991;65:650-7. Weir DJ, Williams BH. Clinical effectiveness of mechanical-chemical tissue displacement methods. J Prosthet Dent 1984;51:326-9. Bishop K, Briggs P, Kelleher M. Margin design for porcelain fused to metal restorations which extend onto the root. Br Dent J 1996;180:177-84. Trivedi SC, Talim ST. The response of human gingiva to restorative materials. J Prosthet Dent 1973;29:73-80. Nemetz H, Donovan T, Landesman H. Exposing the gingival margin: A systematic approach for the control of hemorrhage. J Prosthet Dent 1984;51:647-51. La Forgia A. Mechanical-chemical and electrosurgical tissue displacement for fixed prosthesis. J Prosthet Dent 1964;14:1107-14. Benson BW, Bomberg TJ, Hatch RA, Hoffman W Jr. Tissue displacement methods in fixed prosthodontics. J Prosthet Dent 1986;55:175-81. Gardner FM, Walton JN. Gingival displacement techniques. In: Clinical Aspects of Dental Materials. Washington, DC: United States Army Institute of Dental Research; 1986. p. 165-75. Land MF, Rosenstiel SF, Sandrik JL. Disturbance of the dentinal smear layer by acidic hemostatic agents. J Prosthet Dent 1994;72:4-7. Land MF, Couri CC, Johnston WM. Smear layer instability caused by hemostatic agents. J Prosthet Dent 1996;76:477-82. Soben P. Essential of Preventive and the Community Dentistry. 2 nd ed. Arya (Medi) Publishing House: New Delhi; 2007. p. 153. Shillinburg HT, Sumiya H, Whitsett LD, Richard J, Brakette SE. Fundamental of Fixed Prosthodontics. 3 rd ed. Chicago: Quintessence Publishing Co. Inc.; 1997. Gardner FM. Margins of complete crowns - Literature review. J Prosthet Dent 1982;48:396-400. Rosenstiel SF, Land MF, Fujimoto J. Contemporary Fixed Prosthodontics. 3 rd ed. St. Louis: Mosby Inc.; 2001. Tylman SD, Malone WF, Koth DL. Theory and Practice of Fixed Prosthodontics. 8 th ed. USA: Medico Dental Media International Inc.; 2001. Azzi R, Tsao TF, Carranza FA Jr, Kenney EB. Comparative study of gingival retraction methods. J Prosthet Dent 1983;50:561-5. Kamansky FW, Tempel TR, Post AC. Gingival tissue response to rotary curettage. J Prosthet Dent 1984;52:380-3. Kellam SA, Smith JR, Scheffel SJ. 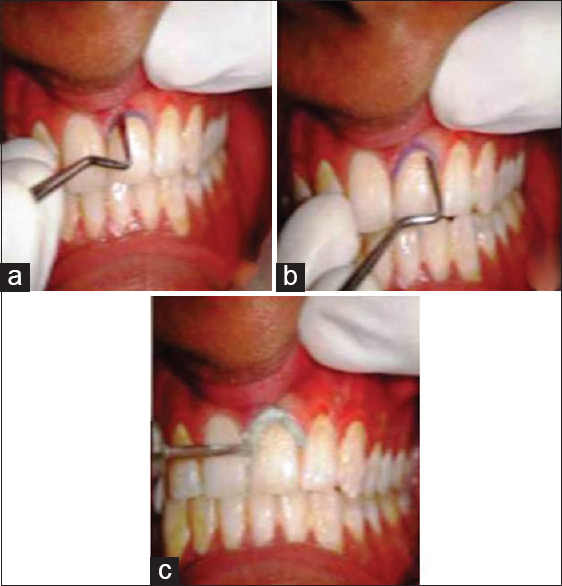 Epinephrine absorption from commercial gingival retraction cords in clinical patients. J Prosthet Dent 1992;68:761-5. Ramadan FA, el-Sadeek M, Hassanein el-S. Histopathologic response of gingival tissues to hemodent and aluminum chloride solutions as tissue displacement materials. Egypt Dent J 1972;18:337-52. Mokbel AM, Mohammed YR. Local effect of applying aluminum chloride on the dento-gingival unit as a tissue displacement material. Egypt Dent J 1973;19:35-48. Burrell KH, Glick M. Hemostatics, astringents and gingival displacement cords. In: Ciancio SG, editor. ADA Guide to Dental Therapeutics. 2 nd ed. Chicago: American Dental Association; 2000. p. 104-18. Council on Dental Therapeutics of the American Dental Association. Hemostatics and astringents. In: Accepted Dental Therapeutics. 40 th ed. Chicago: American Dental Association; 1984. p. 334-41. Cloyd S, Puri S. Using the double-cord packing technique of tissue retraction for making crown impressions. Dent Today 1999;18:54-9. Runyan DA, Reddy TG Jr, Shimoda LM. Fluid absorbency of retraction cords after soaking in aluminum chloride solution. J Prosthet Dent 1988;60:676-8. Phatale S, Marawar PP, Byakod G, Lagdive SB, Kalburge JV. Effect of retraction materials on gingival health: A histopathological study. J Indian Soc Periodontol 2010;14:35-9. Laufer BZ, Baharav H, Ganor Y, Cardash HS. The effect of marginal thickness on the distortion of different impression materials. J Prosthet Dent 1996;76:466-71. Bowles WH, Tardy SJ, Vahadi A. Evaluation of new gingival retraction agents. J Dent Res 1991;70:1447-9. Raja Z, Nair C. A survey on the use of displacement cord by the dental professional. J Indian Prosthodont Soc 2003;3:3.